Founded in 2010 in Boca Raton, Funky Buddha Brewery opened a production brewery in 2013. Ever walked into a good doughnut shop and gotten a whiff of a perfect combination of aromas—coffee, slightly burnt sugar, a touch of chocolate, maple syrup and doughy goodness? That’s what comes screaming out of a glass of this Funky Buddha offering. 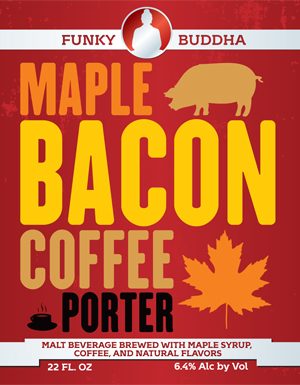 French-pressed coffee, cocoa and maple sweetness abound, but the bacon is shy, perhaps non-existent. There’s a slight bitter roasted note that reminds us this is a porter at heart, but otherwise the flavors lean toward the sweet side. Crack one open for breakfast—or any other time of the day. At first I rolled my eyes, but then I realized that as a man who’s brewed bacon beer, coffee beer and maple beer, I live in a glass house. The beer is black, of course, and … okay, this is hilarious. If you don’t smile when you smell this beer, you don’t have a sense of humor. More “maple-flavored” than maplelike, and more coffee-ish than bacon-y, but the impression is a still-life of a pancake breakfast. It’s all there on the palate, too. It’s a one-trick pony, but it’s a really neat trick. Pork belly is the easy route, but pros will go Montréal—foie gras all the way.